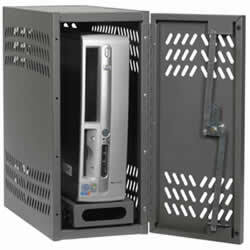 Secure-It - Computer Security Enclosures for Tower & Desktop PC and Apple computers. Available in six different sizes with unique slide out tray, the CPU locker series provides computer and server protection. These computer enclosures protect your hardware, along with limiting access to USB drives, plugs and on/off switches. 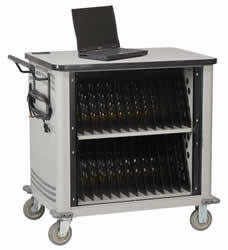 Store and charge your laptops with the added benefit of security and mobility! 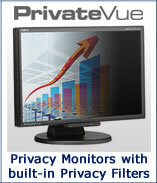 Available in 20-, 26-, and 32-laptop capacity versions. Not finding what you need? Give us a call at (800) 466-7636 and we'd be glad to help you out!